With No. 12 needles and main shade (M) cast on 60 stitches loosely, and arrange over 3 needles. Work in k3, p3 rib for 8 rows. Change to number 10 needles. Rnd 1: Change to contrast colour (C) and knit all sts. Rnds 2-8: Work in k3, p3 rib, as set. Rnd 9: Change to colour M and knit all sts. Rnds 10-12: Work in k3, p3 rib, as set. Rnd 13: Joining in colour C, *k1 M, k1 C; repeat from * to end. Rnd 14: *k1 C, k1 M; repeat from * to end. Rnd 15-16: Repeat last 2 rows once more. Rnd 17: Continue with M only, *k3, p1, k1, p1; repeat from * to end. [Editor's note: this strange row is a k3 p3 rib avoiding purl sts while changing colour]. Rnds 18-20: Work in k3, p3 rib, as previously set. These 20 Rows form the pattern. Break off M and slip the first 16 sts of the round on to a spare dpn, and slip the last 13 sts on to a second spare dpn. [Editor's note: these can be your No. 12 needles if required]. Row 1: Using C knit all sts. Row 2: p2, * k3, p3; repeat from * to last 5 sts: k3, p2. Row 3: k2, * p3, k3; repeat from * to last 5 sts: p3, k2. Row 13: Join in C, *k1 M, k1 C; repeat from * to last st, k1 M.
Row 14: *p1 C, p1 M; repeat from * to last st, p1 C.
Rows 15-16: Repeat last 2 rows once more. Row 17: Using M only: k1, p1, *k3, p1, k1, p1; repeat from * to last 5 sts: k3, p1, k1. Row 18: k2, * p3, k3; repeat from * to last 5 sts: p3, k2. Work 2 more rib rows in M to complete the 20 row pattern. Now work one more pattern set of 20 rows, and then the first 8 rows again, decreasing 1st at the end of the last row, (30 sts). [Editor's note: make any measurement adjustments here]. Using M only, continue in stocking stitch, (one row knit, one row purl), decreasing 1 st (k2 tog) at each end of the next, and every alternate row, until 14 sts remain. Leave these sts on a safety pin. Return to the remaining 29sts; place both sets together on one needle, and continue to work on them in st st, using colour M.
Next row: k2tog tbl, k12, make 1 st, k13, k2tog. (28 sts)]. Continue decreasing one st at each end of every alternate row, until 14 sts remain. Now begin to increase one st at each end of every alternate row, until there are 30 sts. Continue in st st until the foot is the same length as the top. [Editor's note: remember any measurement adjustments you made before]. Shape toe as given for the top. Graft the two sets of 14 sts together. Press the work lightly with a hot iron using a damp cloth. Sew up the heel seams and the seams on the sides of the foot. 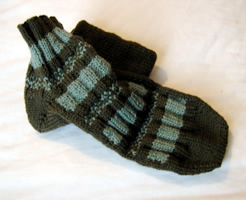 Make a second sock to match. 2 x 50g skeins of main shade and 1 x 50g contrast in double knitting wool. Two sets of 4 double pointed needles, Nos. 10 and 12. 24 sts to 4 inches measured over stocking stitch on No 10 (3¼mm) needles. The pattern as written should fit a foot of 11 inches in length.